The Moroccan Sahara is a must-see for anyone who is travelling in Morocco. Located under North Africa, the Sahara Desert is almost the same size as the USA; while America is just over 9.8 million square kilometres, the Sahara Desert is at 9.2 million square kilometres. On top of that, it’s also the biggest hot desert in the world! A lot of people who visit Morocco will take a few days out of their travels to merely wander around the Sahara Desert and enjoy everything that it has to offer. Some enjoy the heat and others enjoy gazing at the stars during the night. We can’t emphasise enough how beautiful the Moroccan Sahara Desert is, and if you ever have the chance to visit it, don’t give it a second thought. A lot of questions about the Sahara Desert are asked by travellers and tourists online and offline. 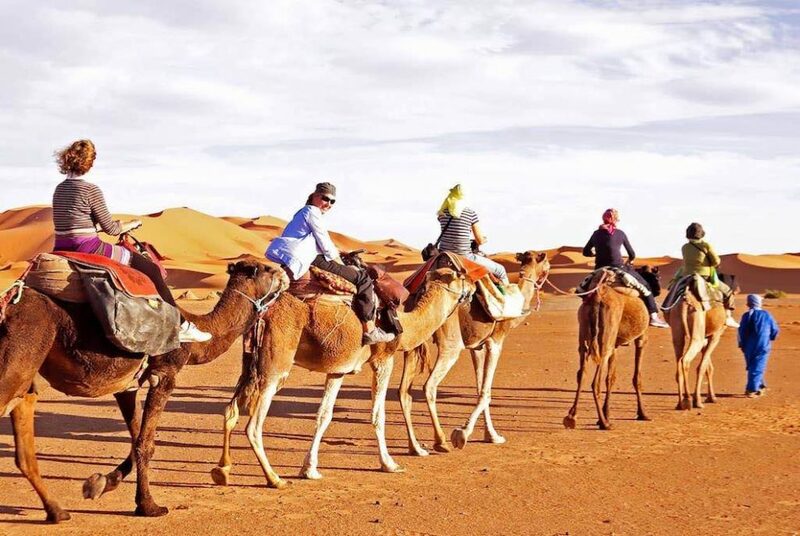 In this post we have answered some of the most common questions that we get from travellers who are checking out the Sahara Desert for the first time. Question #1 – How long should I spend travelling the Sahara Desert? Question #2 – What items should I have packed when I go to the Sahara Desert? Question #3 – Should I take my children with me? Question #4 – What time of year is best for a trip to the Sahara Desert? Question #5 – Are there day trips available to the Sahara Desert? 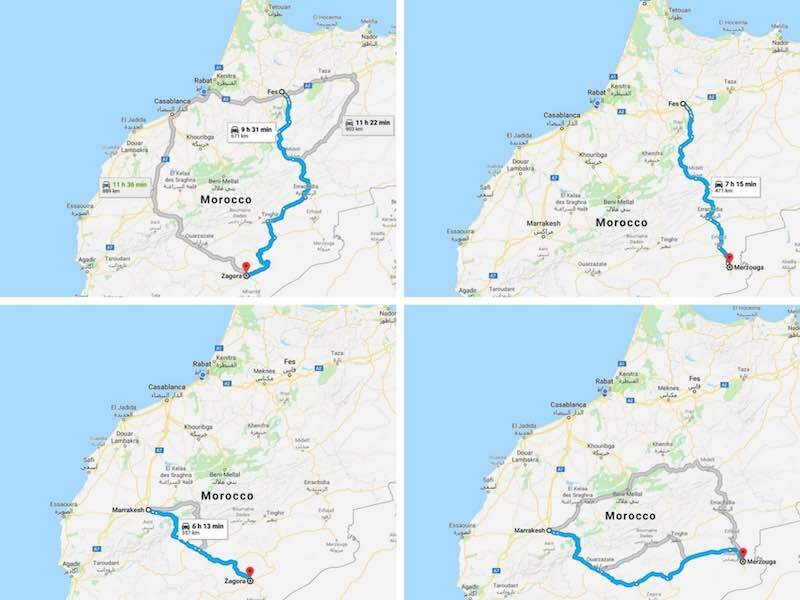 Question #6 – How far away is the Sahara Desert from Fez and Marrakech? Question #7 – What’s better, Erg Chigaga or Erg Chebbi? Question #8 – When booking a trip, should I ask for a private trip or a group tour? How long you spend in the Sahara Desert is completely up to your own discretion, but we highly recommend that you spend more than one night (at least two or three!). A few nights of relaxing under the lit-up sky is an experience that you’ll never forget and that you’ll always want to return to. As well as giving you the chance to enjoy the night sky, spending more than one day gives you more time to relax and take in all that the Sahara has to offer. The longer that you’re there, the more you can appreciate it. Either a windbreaker or a jacket (preferably not a heavy jacket as it will make your load heavier). Comfortable pants to prevent irritation from camel fur (it’s rougher than it looks!). Comfortable footwear such as boots, sandals, or sneakers. Either a hat or a headscarf to protect your head from sand, dust, and the sun. Sunscreen for your skin and a chapstick for your lips. A flashlight and spare batteries so that you can see at night. Lastly, a camera so that you can capture your memories. A camera lens brush would also be ideal to remove any dust that lands on the lens. Aside from these essentials, you should also make sure that you have enough food and water to last the entirety of your planned journey (and a little extra, just in case). Sure thing! 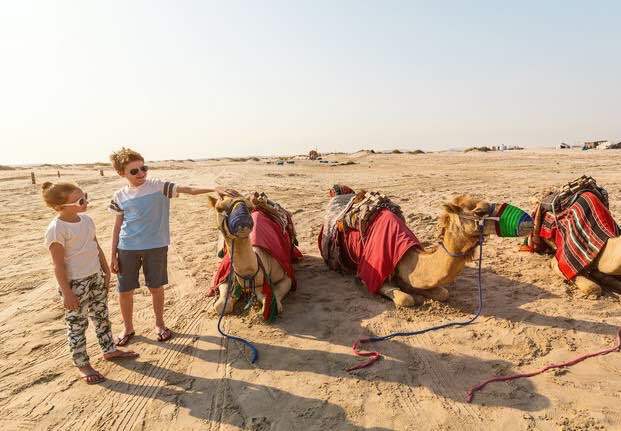 Taking on the Sahara Desert shouldn’t stop you from bringing your kids along for the ride. That being said, there are a few other things that you’ll have to keep in mind in order to ensure that nothing disrupts your travels. Children won’t be as appreciative of the views along the way. 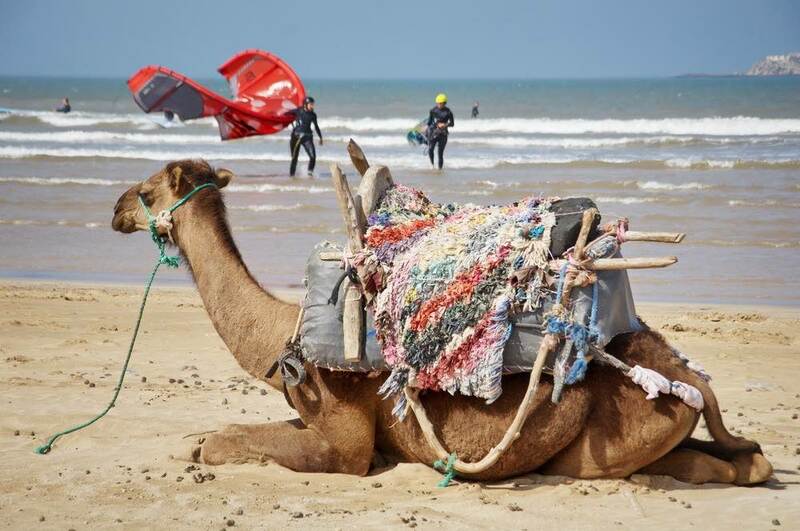 They’ll quickly get bored of the car journey, camel ride, and sitting in a desert at a campsite. Make sure that you bring a few things to keep them entertained (e.g. a few books, an MP3 player, or even an instrument). Following on from the previous point, there’ll be a lot of time spent in a car and it’s more than likely that your children will get agitated by sitting for long periods of time. Our suggestion is that you consider a private tour instead of a group tour. Doing so means that you can stop the car journey every so often, get your children out of the car for a short while, and keep them as happy as possible. The chances are that after reaching a campsite, you’ll be given a traditional meal from Morocco. This will include tagine chicken breast and a variation of vegetables. For those of you who have children that are fussy eaters, prepare and pack a meal for them instead. Fortunately, nothing here is too inconvenient and it won’t take you too much time to make your plans more child-friendly. To enjoy your time travelling through the Sahara Desert as much as possible, visiting between April and October is ideal. This is the time of year when the temperature during the day exceeds 20 degrees Celsius. On the other hand, you should avoid the Sahara in January and December as this is the during the Saharan Winter and at night, the temperature is significantly colder – it’s known to drop below freezing! The Saharan Summer is between June and September and during this season, the daytime temperatures are a bit much hottest which will make your journey less enjoyable. The last thing to take note of is that the rate of sandstorms increases between January and May. While you might feel as though this won’t be too much of a problem, your travels will take longer. Yes, there are day trips available to the Sahara Desert. If you don’t feel as though spending the night in the Sahara Desert is your thing, or you simply don’t have enough time to explore it as you’d like, there are day trips. The best place to stay for a day trip is Merzouga. 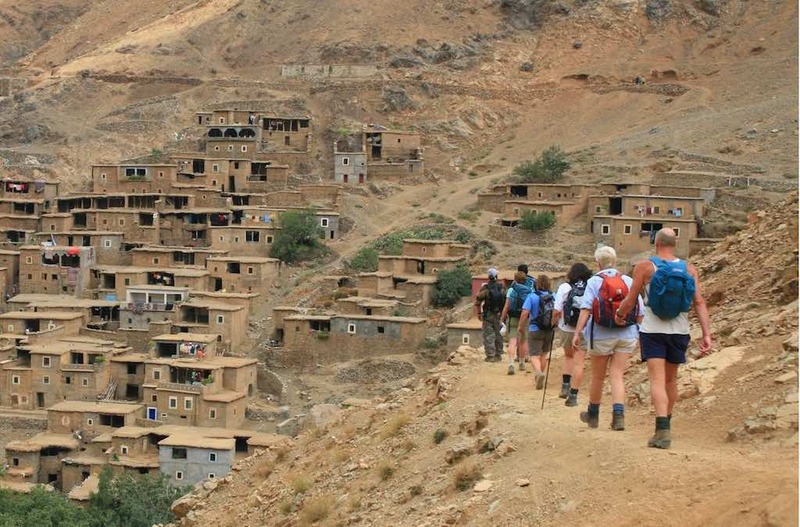 However, if you plan on staying in either Fez or Marrakech, day trips aren’t an option. Both places are very far away from the Sahara Desert and it can take up to 8 hours to reach the desert’s sand dunes from both cities. Marrakech is around 370 miles (600 kilometres) away from the town of Merzouga and 223 miles (357 kilometres) away from Zagora. Fez is around 290 miles (471 kilometres) away from Merzouga, but 415 miles (671 kilometres) from Zagora. Remember, when we take into account that a lot of your journey will consist of following basic roads and going over mountains, it isn’t as far as it seems, and these distances are somewhat irrelevant. The two most popular sand dunes are Erg Chebbi (near Merzouga) and Er Chigaga (near Zagora). But, as great as they both are, they’re two very different experiences. Erg Chebbi is the more popular of the two as it is easy to access and there are hotels that you can travel from about 30-minutes away when you ride a camel. However, Erg Chigaga is a lot more rural and is great for anyone who is looking for a more eye-opening experience. If you’re able to enjoy the Sahara Desert for a few weeks then it’s definitely worth checking out both of these sand dunes and taking in the beauty that they entail. As we said before, if you have children then a private trip would be ideal. But, if you’re travelling without children, the type of trip is a matter of preference. Organized tours are fantastic for those who don’t know a lot about the Sahara Desert and who want to learn all about it. A private tour is more flexible, and your tour guide will be able to tailor the tour. You’ll get to experience the Moroccan culture by visiting local towns and learning about the best tourist hotspots that are in the desert. Now, even though you can choose to travel without a tour guide, we highly recommend that you don’t enter the main desert without an experienced professional. This is unsafe and could put you in danger. All in all, the Sahara Desert is a fantastic place to travel to and it should be on everyone’s bucket list. 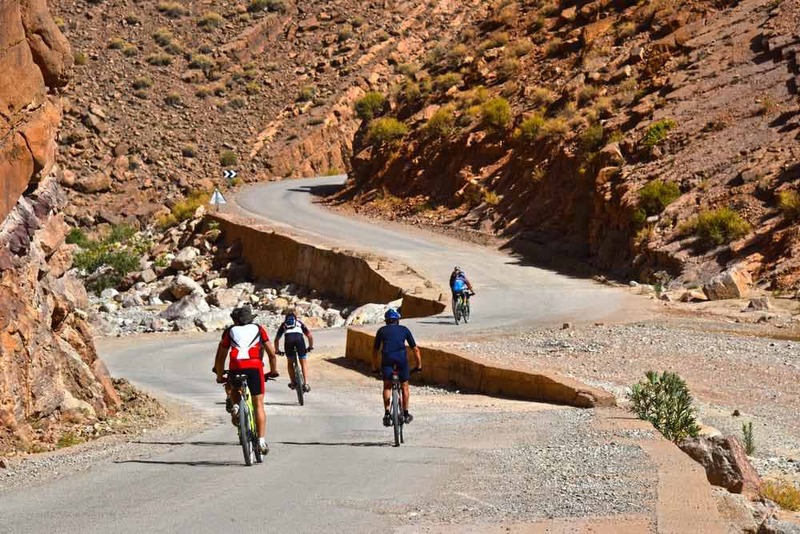 Even if it’s not something that you would usually consider, if you plan on visiting Morocco then you should without a doubt check it out – you won’t regret it.